bypassing, or removingone or more of the Snake River dams is not 'reasonable'... ,"
The investment has been huge: more than 20 years, three federal judges, five defeats for the federal government and well over $10 billion spent. All this, and Idaho's wild salmon still hover on the brink of extinction. In a powerful ruling delivered last week, Judge Michael Simon lambasted the federal government for failing to show that its dams on the Columbia and Snake rivers aren't driving endangered salmon and steelhead toward extinction. Meanwhile, the government continues to live in an alternative reality. There are mountains of peer-reviewed science that point directly at four dams on the lower Snake River in eastern Washington as the major cause of the precipitous decline of Idaho's wild salmon. Simon stressed this point. "It is doubtful the (federal government) could demonstrate that breaching, bypassing, or removing one or more of the Snake River dams is not 'reasonable'. . .," he wrote. Idaho's rivers and streams once teemed with wild salmon and steelhead that provided sustenance since time immemorial. They brought ocean nutrients to the high country of the inland Northwest -- nutrients that formed the building blocks of a complex web of aquatic life that helped make Idaho's great rivers a national treasure. Without salmon, these rivers will be a shadow of what they once were. The lower Snake dams were foisted on the Northwest with glowing promises of waterborne commerce to Lewiston and an abundance of hydropower for the region. Neither promise has materialized. Commerce on the river peaked in 1997 and has steadily and dramatically declined ever since. Moreover, container traffic all but ceased on the lower Snake in 2015, and overall shipping levels are well below the Corps of Engineers' own definition of negligible. The lower Snake transportation system is a taxpayer-subsidized boondoggle that benefits few at the cost of many -- including Idaho's endangered salmon. Meanwhile, an underutilized railroad parallels the entire lower Snake River corridor and with minor modifications could easily absorb river-borne commerce -- with room to spare. 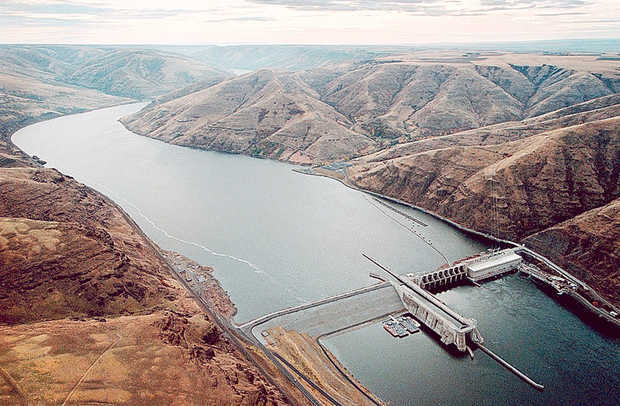 Another purpose of the lower Snake River dams is hydropower generation. Like waterborne navigation, the hydropower generated by these dams is of limited quantity and value. Maximum generation takes place when demand and value are low. In times of high demand -- the middle of the summer -- flows are at their lowest, and contributions from these dams are minimal. Further, the Pacific Northwest is awash in surplus energy. The region has a 15 percent surplus of electricity. If the lower Snake River dams, which provide up to a paltry 4 percent of the region's power, were to vanish overnight, nobody would notice. A recent economic analysis showed that for every ratepayer and taxpayer dollar pumped into the lower Snake system, only 15 cents is returned as a public benefit. If the average American operated their finances in this fashion, they'd quickly be bankrupt. The court's rejection of yet another illegal federal plan for operating dams on these rivers is a clear message that the status quo is no longer an option for the federal government. Kevin Lewis is the conservation director at Idaho Rivers United.